I used to hate writing. I thought it was just about term papers and book reports. 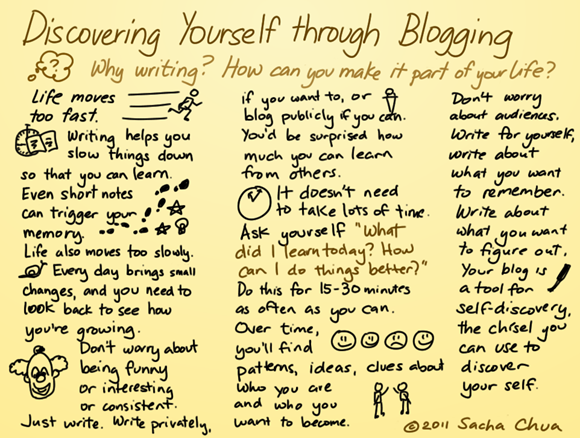 It took blogging for me to discover that I could write for myself, not just for teachers, and that writing – my technical notes, my decisions, my “here’s how I’m trying to figure out life” confusions – could save me a lot of time. So now I want to help other people get over that hump, get out of that rut, get going. Get writing. Holly Tse will be interviewing me at 9 PM EDT today (Aug 16) on how blogging can help you with your process of self-discovery. I don’t have sound-bites or snazzy “here, buy this e-book” self-promotions, I just want to help people figure out how to use blogging to learn more about life. It’s not just about personal branding, search engine optimization, or being cool. It’s useful for getting the hang of things, taking notes, and sharing them with others. 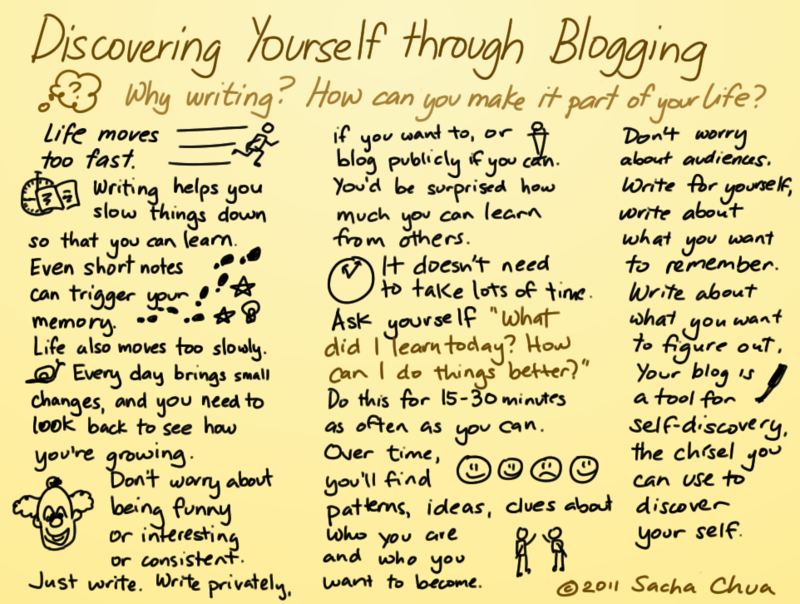 You might also be interested in other things I’ve written about blogging, including this seven-part series packed with thoughts and tips on the value of blogging. Hope that helps! 2013: Learning how to work with stock photos: Can you help me?